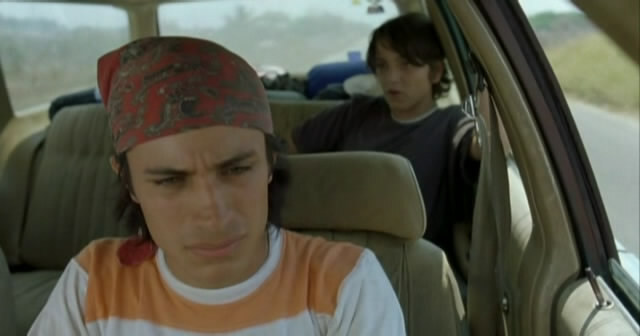 Gael García Bernal (l.) and Diego Luna hit the road in Y tu mamá también. The smash 2001 road comedy Y tu mamá también from the Oscar-winning director Alfonso Cuarón (Gravity) is that rare movie to combine raunchy subject matter and emotional warmth. Gael García Bernal (Casa de mi Padre) and Diego Luna (Contraband) shot to international stardom as a pair of horny Mexico City teenagers from different classes who, after their girlfriends jet off to Italy for the summer, are bewitched by a gorgeous older Spanish woman (Tetro’s Maribel Verdú) they meet at a wedding. When she agrees to accompany them on a trip to a faraway beach, the three form an increasingly intense and sensual alliance that ultimately strips them both physically and emotionally bare. Shot with elegance and dexterity by the great Emmanuel Lubezki (The Tree of Life), Y tu mamá también is a funny and moving look at human desire.